Gulf Shores City Hall is located at 1905 West First Street, Gulf Shores, AL 36547; phone: 251-968-2425. Photo: Residential Area along one of Gulf Shores' Canals; Carol M. Highsmith, photographer, Library of Congress [LC-DIG-highsm-07440]. www.loc.gov, accessed July, 2011. 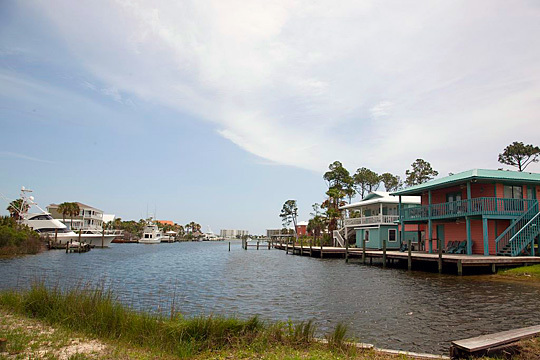 Downtown Gulf Shores, located mostly along the western side of Highway 59 south of the Intercoastal Waterway, is the most complex and complete of the city's activity centers, despite its relatively modest scale. A well-integrated mixed-use center that has evolved steadily over the past few decades, it continues to support the mission and vision of the city and, as a result, remains the symbolic heart of the community and of city government. The intersection of Beach Boulevard and Highway 59 is the city's traditional center of beach-oriented tourism and its primary image in the minds of many visitors. Neighborhood centers are dispersed throughout the city, located along County Roads 4 and 6 (in northwest Gulf Shores), Fort Morgan Road, East Canal Drive, and Cotton Creek Drive. Source: City of Gulf Shores Alabama, Land Use Plan, 2008, www.gulfshoresal.gov, accessed July, 2011.